The purpose of this assessment probe is to elicit students’ ideas about the properties of atoms. The probe is designed to determine whether students can distinguish between the microscopic properties of an atom and the macroscopic properties of a substance or object made up of atoms. This free selection includes the Table of Contents, Preface, Introduction, and the Index. This book introduction chapter addressed the issue of student generalization of a topic. Students do generalize, however, teachers in this instance found students did not generalize about life cycles. The teachers and administrators found that students neglected to apply their knowledge to all plants and animals after conducting an inquiry investigation. The chapter goes on to introduce how teachers can use probes can be used in the classroom to avoid this scenario in future lessons. 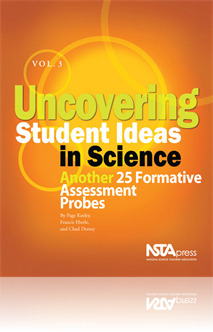 The chapter suggests nine pointers that will help the implementation of probes in a classroom and for use of formative assessment. I liked this introduction to the book because of how in depth it goes into each suggestion. There are examples for most of the suggestion probes, which are directly applicable to teachers and easy to read and comprehend. This file also provides readers with access to a few probes that can be directly used in their classrooms, and provides readers with pointers for curriculum and instruction. Overall, this book introduction is rather useful to teachers and easy to follow for implementation.